I’m about to see some things that can’t be unseen, to learn some things that can’t be unlearned, and to think some things that can’t be unthought. Within less than a fortnight, a significant amount of my genetic destiny will be revealed to me by the magic of consumer genetics. And the suspense is killing me. As a metrics and diy bio junky, I’ve been very eager to explore the essential blueprints to my being. It’s incredible to even imagine that most everything I am can be reduced to a fundamental set of instructions based on patterns of just four letters (the rest can be accounted for by ‘nurture’, which for me is mainly an amalgam of adventure novels and Saved by the Bell episodes, as best I can tell). When I first heard about 23andme several years ago, I was pretty sure the future was coming fast. However, the price tag was still a bit steep for me. Considering the Moore’s Law depreciation of sequencing costs, I just couldn’t rationalize the expense for a report that didn’t even cover my entire genome. I even signed up for the Personal Genome Project in the interim. Unfortunately, they still haven’t taken me in, and my enrollment seems unlikely given their preference for people with known rare genetic conditions. So I’ve waited for the price to go down. And finally an opportunity for low-cost genotyping! April 23rd was National DNA Day, during which 23andme (named after your 23 chromosome pairs), offered their full package (including ancestry, health, and extended sequence access) for just $99. This was a $400 discount from the normal $499 price tag. Obviously, I jumped on the deal. Of course, 23andme is just one of many consumer sequencing companies (including Navegenics, deCODEme, and Knome, among others). However, 23andme offers one of the most complete offerings I’ve found. They give you ~600,000 known “single nucleotide polymorphisms” (or SNP’s, basically just single letters in your sequence where you’re likely to vary from others in a meaningful way), including mitochondrial DNA. Granted, this is just a small portion of my entire genome (only ~0.02% of my 3 billion bases, to be ~exact). However, it represents many of the significant places (or loci) where I differ from you or anyone else. It also includes many compelling factors involved with a range of heritable conditions. And I’ll be particularly interested to learn things like my eye and hair color. Now, it’s not a terrible idea to take a step back and consider the consequences of such deep self-knowledge. First of all, I have to ponder the psychological impacts this information could have on me. What if I find out I have some rare genetic disorder that is reliably linked to a terminal illness? What if I find some factors that would indicate the need for a drastic change in lifestyle? What if my dad isn’t my dad? What if I find that I’m completely boring, genetically? These are all possibilities. But I’m prepared (or at least momentarily indifferent) to their consequences. I believe that understanding the root of your medical condition can help you make educated choices moving forward, and I intend to leverage any information I gain. However, I am slightly more suspicious of the potential legal implications. 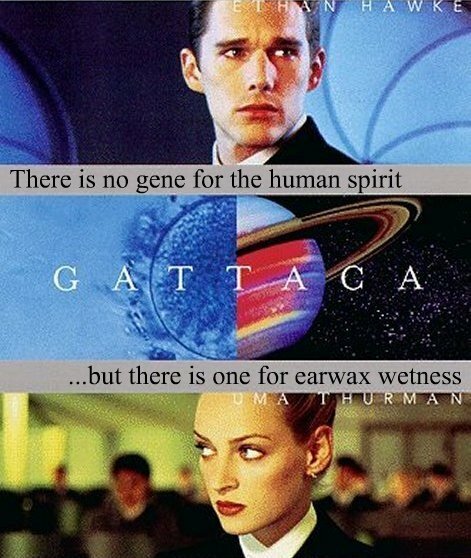 Just imagine a Gattaca-esque world (by the way – notice the title is made of A, T, G, C) where your job, insurance, and even mate, are essentially determined by the strength of your genetic code. That’s some pretty scary stuff. And most people don’t seem to realize how close we are to this (at least technologically). There are already a number of opportunities for genetic theft. It will be very important for the government to enact some tough regulations that can withstand any assault on personal genomic privacy. Fortunately, we currently have a law protecting us from genetic discrimination with respect to insurance and employment. It’s no secret that I’m a fan of data. I’d like to be as quantitative as possible in my life choices. Within the realm of health, this has primarily manifested itself in the use of activity-tracking applicaitons, such as CardioTrainer for running and Daily Burn (formerly Gyminee) for weight training. However, my genome represents a vast bank of data that I could never empirically derive by phenotypic analysis alone. I’m super excited to finally get access to even a small portion of this raw data. Although obviously I could have accessed a lot of this information by myself using several methods (including outsourcing directly to Illumina, as 23andme has done), I wanted to go through one of these companies (and 23andme in particular). This is mainly because I appreciate all of the additional analysis and formatting they provide in presenting the absolutely daunting amount of information contained in my raw genetic sequences. They’ve developed some simple tools to show my ancestry, as well as my health risks (weighted by the reliability of the associated studies in a 5-star format) in a secure, web-based format. Though I could collect and analyze this information myself, it would certainly take a significant amount of effort, and thus I’m willing to pay a service to provide this convenient user experience. And speaking of user experience, it’s interesting to note the relationship between 23andme and Google. Specifically, 23andme received a significant amount of funding from Google (mildly controversial since 23andme cofounder Anne Wojcicki is married to Google cofounder Sergey Brin). But this all makes sense to me. It is Google’s stated goal to “organize the world’s information and make it universally accessible and useful.” Personal genomic data is perhaps some of the most useful information out there, and Google clearly has an interest in organizing it. Considering what they’ve done for the web, I’m excited to see what they can do to simplify genetic relationships. And I suppose I’m about to find out. All my base are belong to Google.